Serotonin or 5-hydroxytryptamine (5-HT) is a monoamine neurotransmitter that widely distributed in the vertebrate central nervous system (CNS). As a phylogenetically ancient signaling molecule, 5-HT serves as a target of numerous physiologic regulators, including modulators of gene transcription, neurotrophic factors and steroids. Therefore, 5-HT is essential for the integration of basic physiology, and plays an overarching role in the modulation of diverse brain functions, such as learning and memory, cognitive control, emotion regulation, sensory processing, autonomic responses, sleep conditioning and motor function. In addition, 5-HT has been an immerging therapeutic target of many psychotropic agents, which impact the formation and activity of 5-HT subsystems. It has been reported that over 90% of 5-HT in the whole body is synthesized in the gastrointestinal tract. However, 5-HT cannot permeate the blood-brain barrier, it has to be synthesized in the brain. In humans as well as most animal species, the initial step in the synthesis of 5-HT is the facilitated transport of the amino acid l-tryptophan from blood into brain. As the precursor to 5-HT, tryptophan is then transformed into 5-HT mainly by tryptophan hydroxylase (TPH) in the brain. Although 5-HT is synthesized in a limited number of neurons in the CNS (nuclei B1 to B9 in the brainstem), its action is widespread in all the CNS. Figure 1. Schematic drawing depicting the serotonergic pathways in the brain. 5-HT is initially floating in the cytosol within serotoninergic neurons. When signalled, the vesicular monoamine transporters (VMAT) transport 5-HT into the vesicles and integrate into the membrane of synaptic vesicles of presynaptic neurons, releasing the neurotransmitters into the synaptic cleft. While, it can be reuptaken via 5-HT transporters (SERT), and deactivated to 5-HTAA by monoamine oxidase (MAO). Once released from presynaptic axonal terminals, 5-HT binds to receptors, which have been divided into 7 subfamilies on the basis of conserved structures and signaling mechanisms. These families include the only ionotropic 5-HT3 receptors and G-protein-coupled 5-HT receptors, the 5-HT1 (1A, 1B, 1D, 1E, and 1F), 5-HT2 (2A, 2B and 2C), 5-HT5 (5A and 5B), and 5-HT4/6/7 receptors. The exact number of 5-HTR varies from species to species, and splicing and editing increase the number of receptors (e.g. 10 splice variants for 5-HT4 receptor and 24 edited forms for 5-HT2C receptor). The 5-HT1 and 5-HT5A receptors couple negatively to inhibit adenylyl cyclases (AC) through Gi/o proteins, leading to an inhibition of cAMP accumulation. In addition, ligation of 5-HT1 receptors also triggers a multitude of other signaling pathways and effectors, including phospholipase C (PLC) pathway. PLC is a membrane-bound enzyme that responsible for the generation of second messengers inositol 1,4,5-triphosphate (IP3) and diacylglycerol (DAG). IP3 mobilizes Ca2+ from intracellular stores (endoplasmic reticulum), resulting in the activate calcium/calmodulin-dependent kinases such as protein kinase C (PKC), which can also be activated by DAG. These kinases phosphorylate other proteins that regulate cellular functions. Presynaptically localized 5-HT1B receptors are thought to be the autoreceptors that suppress excess 5-HT release. The three 5-HT2 receptors share a high homology and similar signaling pathways. They couple primarily through Gq proteins to activate PLC that catalyzes the hydrolysis of phosphatidylinositol bisphosphate (PIP2) into IP3 and DAG, and Phospholipase A (PLA2) which liberates the arachidonic acid (AA) from phospholipids. Free AA is the precursor of the eicosanoids which are generated through the cyclooxygenase reaction, fatty acids, generated through the cytochrome P450 (CYP450) reaction, and the leukotrienes, generated through the lipoxygenase reaction. These components participate in several subcellular functions including signaling transduction, synaptic plasticity, ion channel regulation, neurosecretion and possibly presynaptic inhibition. Specially, 5-HT2A receptors couple to L-type voltage-dependent calcium channels , resulting in the increase in intracellular Ca2+ through Ca2+ influx. which thereby leads to the activation of downstream protein kinase A (PKA) pathway. Another important effector for cAMP is Epac, a guanine nucleotide exchange factor that promotes activation of certain small GTPases (such as Rap1), inducing the extracellular release of sAPPα. Activation of 5-HT4/6/7 receptors by 5-HT is important for the regulation of synaptic transmission, neuronal excitability and neuroprotection. The 5-HT3 receptors are the only ionotropic receptors for 5-HT. The signaling pathway of 5-HT3 Receptor does not involve second messengers and G proteins. Structurally, 5-HT3 receptors are composed of a pentameric structure surrounding a central ion channel, formed with the five α-helical M2 domains and permeable to Na+, K+, and Ca2+. Binding of the neurotransmitter 5-HT to the 5-HT3 receptor opens the channel, leading to an excitatory response in neurons. The rapidly activating, desensitizing, inward current is predominantly carried by Na+. 1. Millan MJ, Marin P, Bockaert J, la Cour CM. Signaling at G-protein-coupled serotonin receptors: recent advances and future research directions. Trends in pharmacological sciences. 2008 Sep 30;29(9):454-64. 2. Palacios JM. Serotonin receptors in brain revisited. Brain research. 2016 Aug 15;1645:46-9. 3. 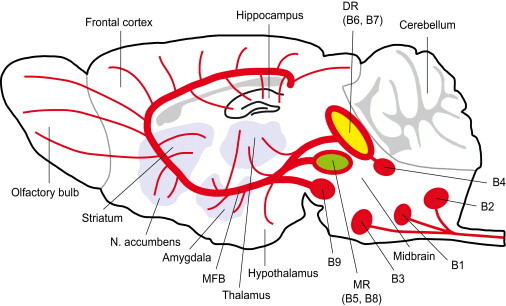 Nichols CD, Sanders-Bush E. Serotonin receptor signaling and hallucinogenic drug action. Heffter Rev Psychedelic Res. 2001;2:73-9. 4. Masson J, Emerit MB, Hamon M, Darmon M. Serotonergic signaling: multiple effectors and pleiotropic effects. Wiley Interdisciplinary Reviews: Membrane Transport and Signaling. 2012 Nov 1;1(6):685-713.